Men of all ages, gathered in the courtyard of the Armavir Provincial Military Commissariat, give a loud military salute to the commander’s greeting, which is followed by response in a manly voice: “Good luck guys and welcome back”. 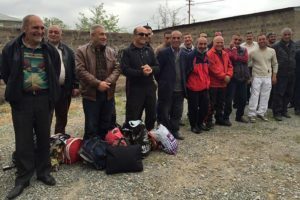 Those who have come from the communities of the province are mostly former members of the Black Panther brigade who participated in the Karabakh war in the early 1990s, and today are again off to stand there next to new generation of fighting men. “All of us are volunteer servicemen. A part of my squad is already in Karabakh. Now we are taking the next group. They have a great fighting spirit: they are well prepared. We should be next to our children. At the cost of life, the independence generation kept the sacred boundary, which has been drawn up by the blood of their parents and grandparents. They are more powerful than us,” says Rustam Gasparyan, the commander of the Black Panther squad and a Member of Parliament. The squad was formed in 1989 and joined other such groups from villages throughout the province. In 1993, a battalion was formed on the foundation of the company. The Black Panther participated in Kelbajar, Fizuli, Kubatlu, Kashatagh defense and liberation battles. A total of 11 fighters of the squad were killed. Khachatur Asatryan, the head of the Margara village council, said that 30 community leaders from the province are among the new volunteers. “The decision is ours. All of us decided to go and support our sons. We protect our land, our territory, our duty is to keep the peace of our families and not to allow the enemy to crush us in our houses, not to allow the border violation even by a millimeter,” said 42-year-old Asatryan. Friends, relatives and children have come to see off those who are leaving. They hug each other and say farewell speeches, like: “We are looking forward to seeing you back”. Razmik Malkhasyan, from the Yeghegnut village is a Karabakh war veteran and says that he is living to be with the children. “Three boys from our family are conscripts. We have to support those children, even though they are more courageous than us,” says the Malkhasyan. 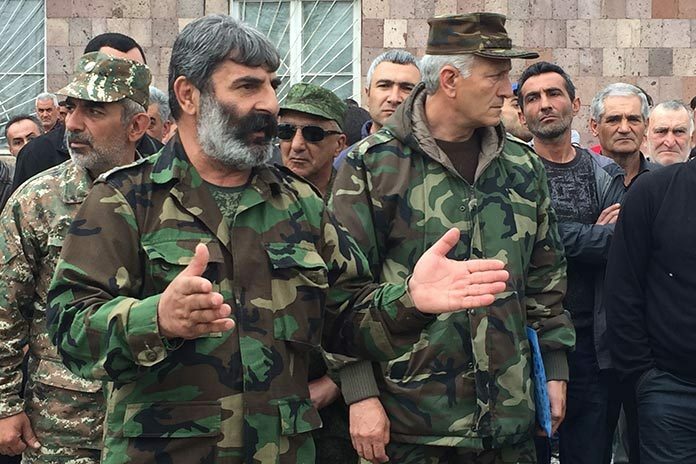 Analyzing the events of the four-day war sparked at the beginning of April at the line of contact between Nagorno-Karabakh and Azerbaijan, the military commander of the Black Panther says that having such a well-equipped army, so many troops, mercenaries, Azerbaijan suffered ignominious defeat. “Those few positions they were able to capture means nothing. In such cases, they must have advanced for tens of kilometers, whereas they were able to advance just a hundred meters, and our soldiers prevented them. They are the same Azeris that stood in front of us [in the late 1980s to 1994]. They had more human resources than us at that time, too, had more weapons, and we were fighting against their tanks with rifles, but won the war. Today, nothing has changed,” says Rustam Gasparyan. Boryan Babayan, a Karabakh war veteran from the village of Lernagog, says that he is ready to die for his native land, and that he goes to finish up some work he has left incomplete. 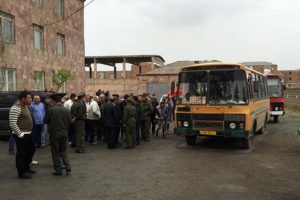 The buses full of volunteer servicemen – full of bravado — are moving to Karabakh. It is the second time Armen Hovhannisyan has taken a group since fighting re-kindled. “I am waiting for my turn: when the time comes, I will go, too. And now, good luck and safe return to all of them. Let no one be missing from their ranks,” he says.